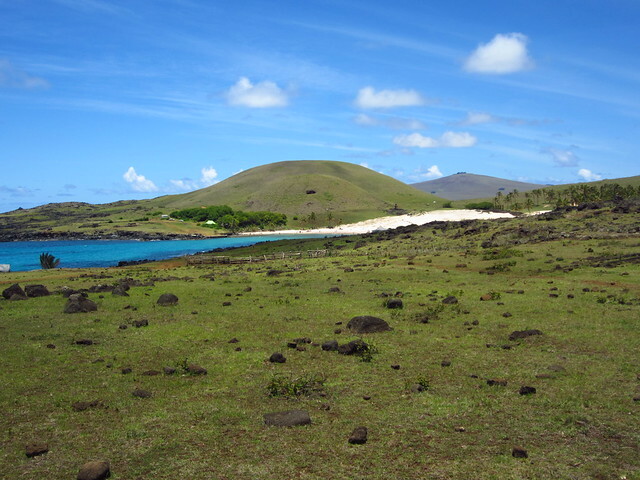 After about four hours of riding along the north coast, we finally saw a glimpse of our final destination: the white sand of Anakena. Doesn’t it look like paradise? 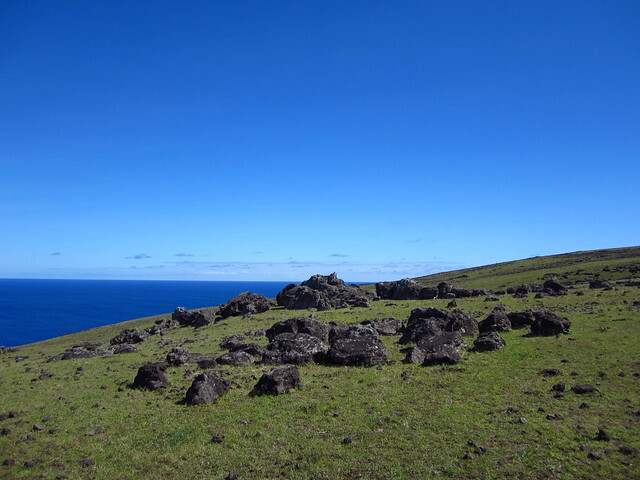 Green grass, black volcanic rocks, white sand, turquoise water, blue sky with dreamy white clouds? I glanced up at the sky to see the clouds creating the most interesting patterns, a beautiful gift to a girl who loves clouds. We dismounted our horses at the edge of the beach, after seeing our guides’ younger brother, here with a group of friends, celebrating the end of the school year. As it was Saturday, the beach was busy, even more so with recent high school graduates who camped out in the nearby campground with their friends. 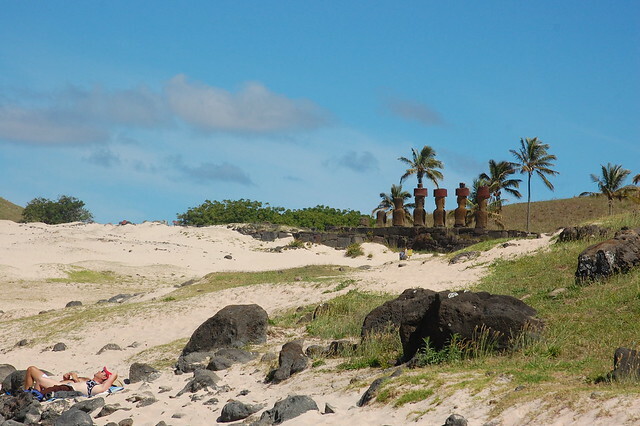 I couldn’t wait to get on the beach and explore the ahu. 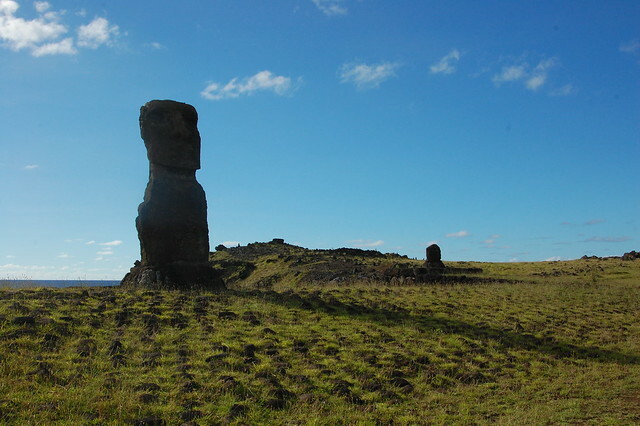 The restored moai of Anakena are well-known due to their location at the only white sand beach on the island, a picturesque (and highly photogenic) place with green hills, palm trees, and the turquoise sea in the background. 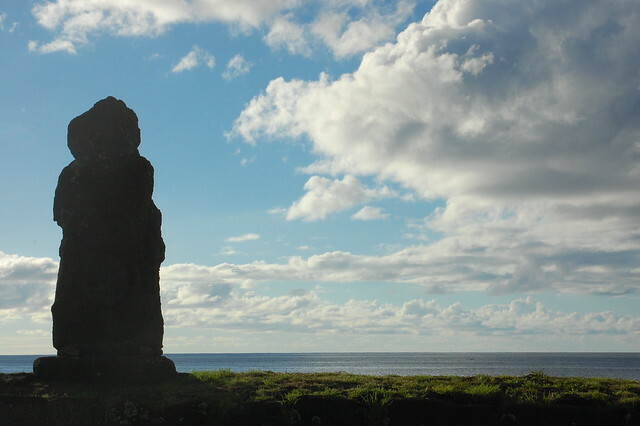 It’s interesting to visit the moai as an amazing, fascinating place while Rapa Nui residents are enjoying the location solely for its beach. 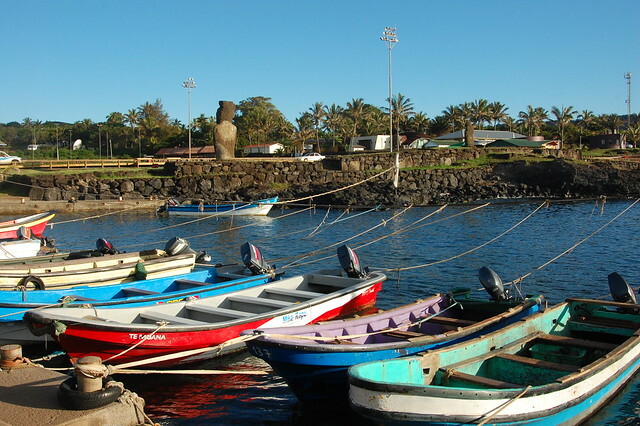 For us, it is a dream to see these statues; for residents, they may not even remember their presence on a normal summer day, when the cool, clear water beckons! 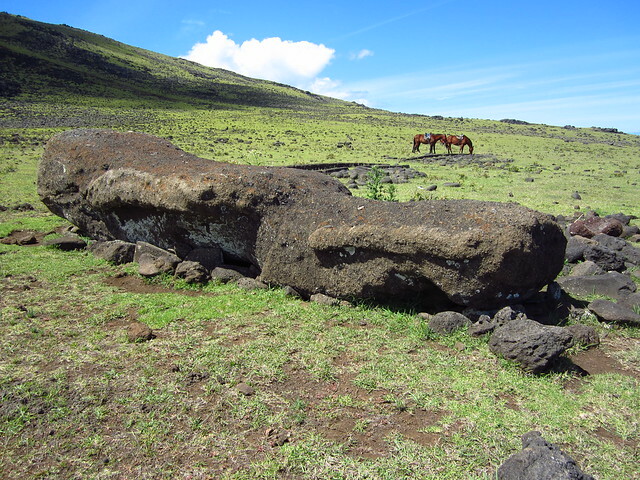 After photographing the moai, my travel companion and I decided to get in the water. 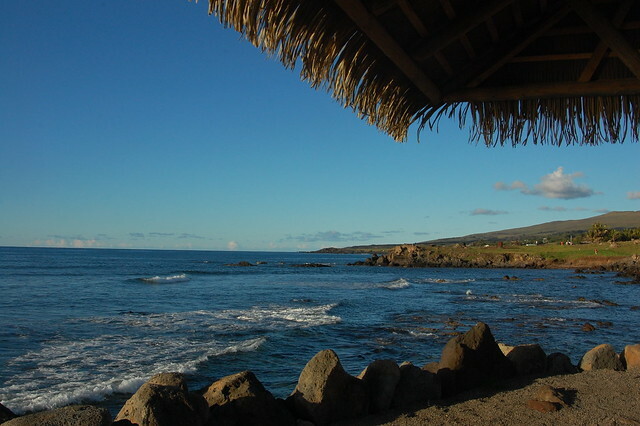 We only had a short while to enjoy the beach before being picked up for our return to Hanga Roa. Luckily, just as each moment of this trip was charmed, they somehow knew we’d need more time and did not come at the arranged time, which was good, because we lost track of time in the water. After a long, hot day in the sun, it was nice to be able to cool off, swim around, and once again take a moment to appreciate the amazing surroundings. 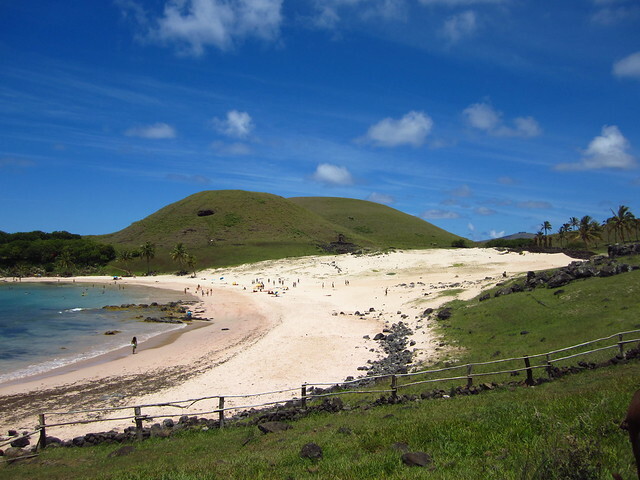 After a while, my friend did a bit of snorkeling while I enjoyed a snack, sitting on the beach and observing people from afar. 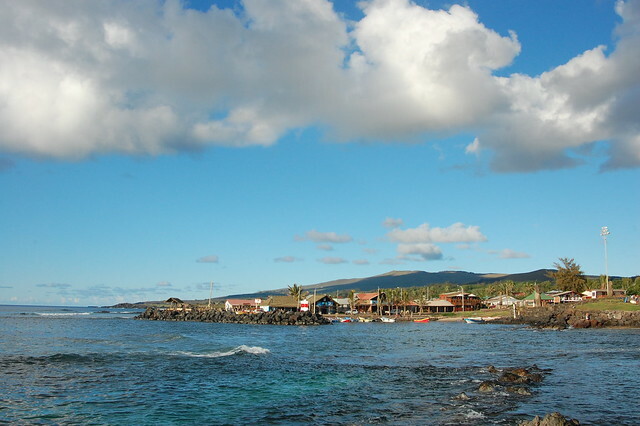 Finally, the owner and his wife came to pick us up and drive us back across the island. 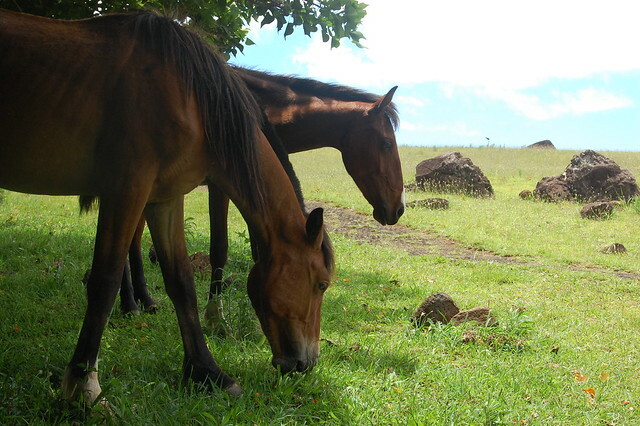 They were happy to hear that we’d had such a good time with their sons, and we asked them to thank them for us, since they’d already returned with the horses. 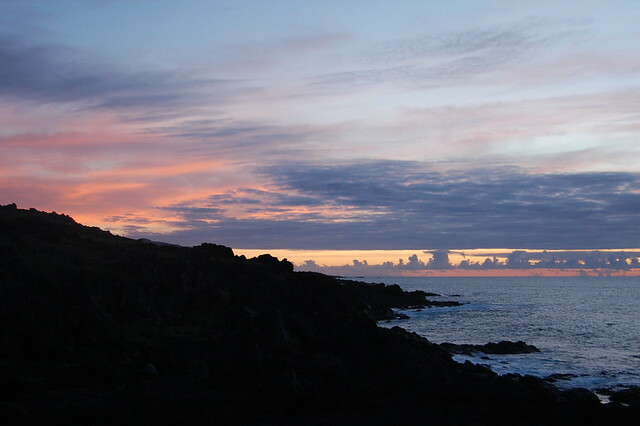 After getting back to Hanga Roa, we decided that we weren’t quite ready for the adventure to end, so we decided to meet up again after a quick shower and rest to trek up the north coast to view the sunset from an interesting location. It was a very good decision. This was one of the most beautiful sunsets I’ve seen. 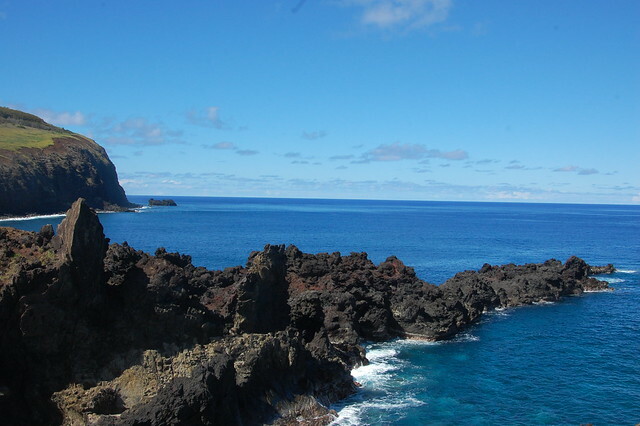 We walked past Ahu Tahai and Hanga Kioe, and continued along the north coast. 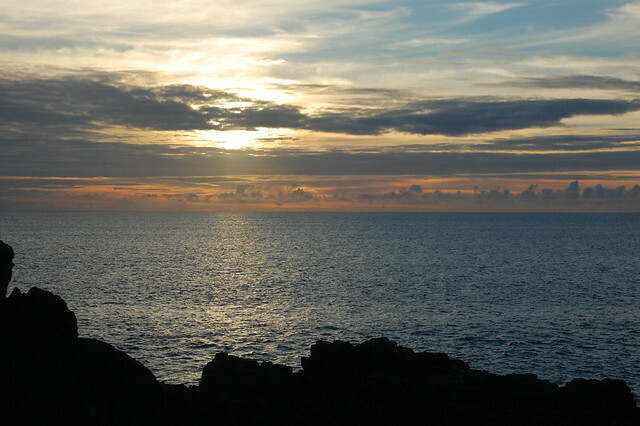 We were tempted to reach a cliff a little in the distance, but I spotted a nice cove where the view of the sunset would be unobstructed and we’d have an easier exit to the main road in the dark. We were the only people out there, and I wanted to be sure we didn’t get lost! 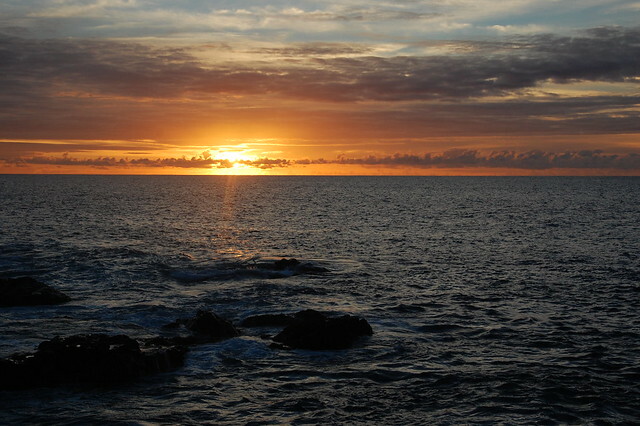 I still remember how I felt watching that sunset, even though it’s been six months. 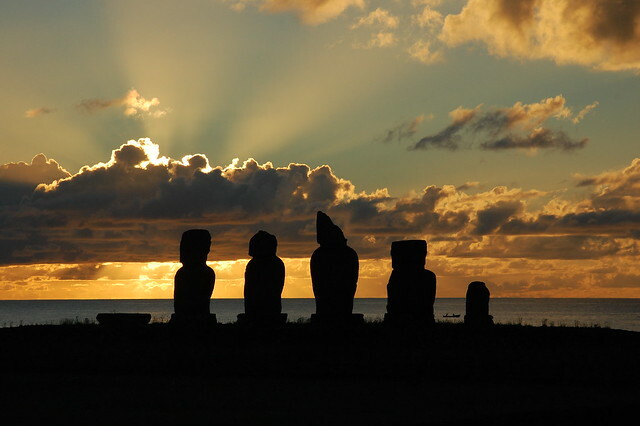 It felt like everything made sense at that moment; I was living my dream of visiting Rapa Nui, watching a gorgeous sunset, in the middle of nowhere, with a great companion for conversation. How cool is your life when you can do these things? It made everything I’d been through to get to that moment absolutely worth it. It is all always worth it; it’s just harder at some moments than others. But these moments are rewards for patience and perseverance. 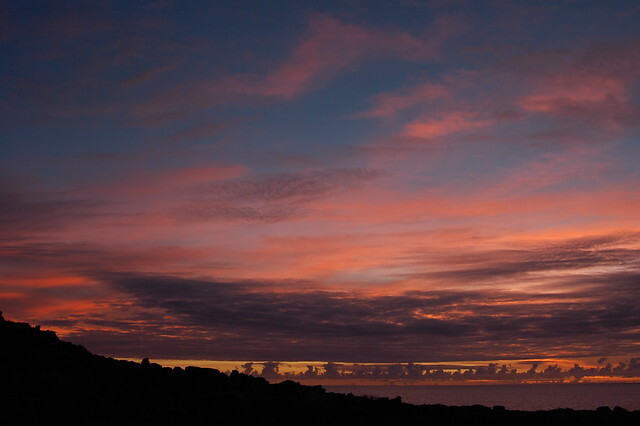 After enjoying the amazing sunset, I knew to linger on to watch how the sky would change afterwards. Just as I suspected, the remaining light played with the clouds in the sky and started to paint them in shades of pink, peach, purple, and other pastels. 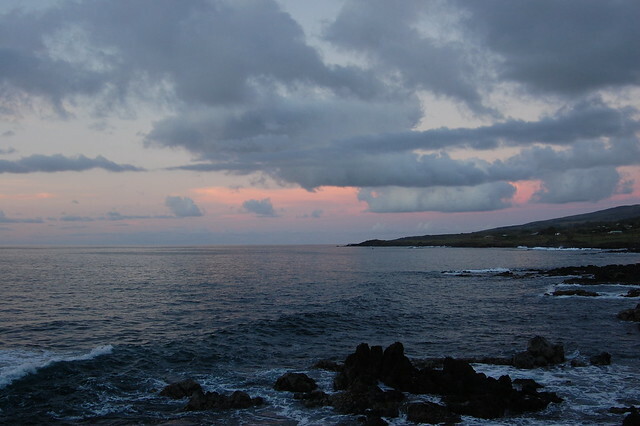 A beautiful pink sky, glowing orange and yellow near the horizon. Absolutely amazing. 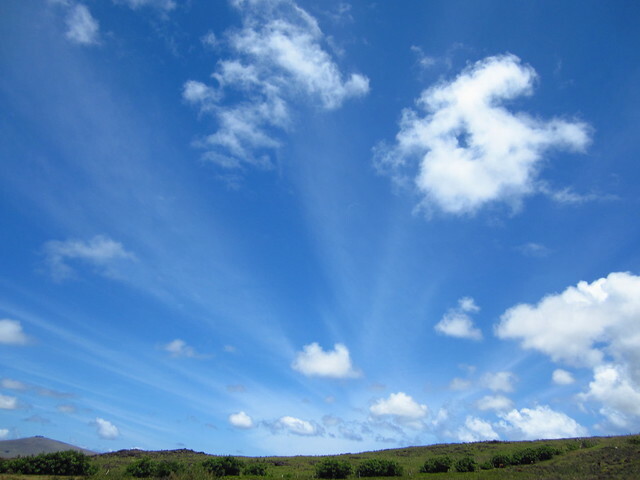 As the sky changed, we had started walking back towards town. 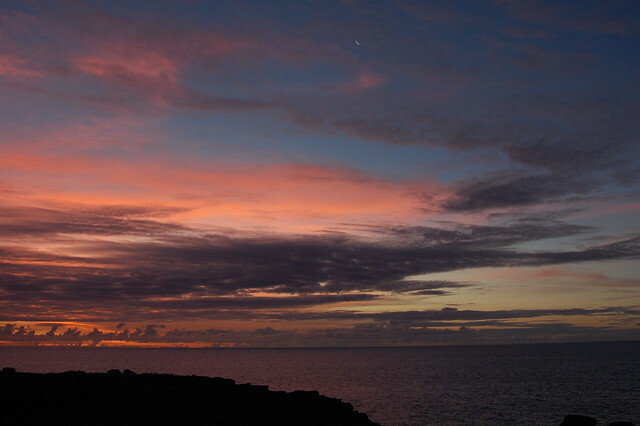 After pulling out my SLR camera to capture these pink moments, I suddenly realized that my point-and-shoot camera was missing. I’d taken it in and out of my camera case several times while removing the other, and somehow it had slipped away from me. 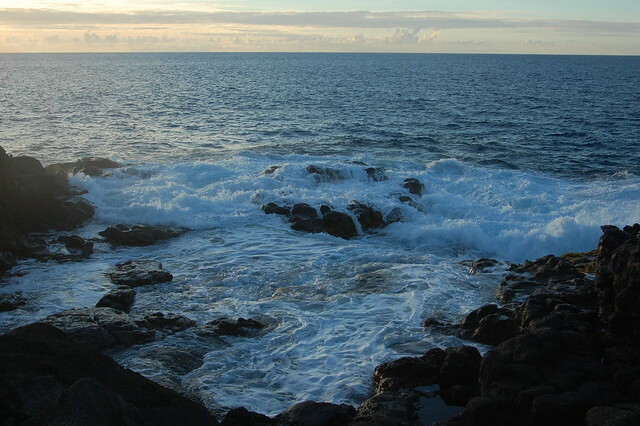 I thought maybe I’d left it in the cove where we’d been sitting, but when we went back to check, it wasn’t there. Night kept falling, and neither of us had brought a flashlight, so I had to let it be, to accept the fact that I might have lost the photos of my entire day horseback riding. I decided to get up early the next day to head back out there to look again, and to not let this ruin a beautiful evening. We walked back to the main road, and as we were following it into town, a bit disoriented in the dark landscape, a car approached us. 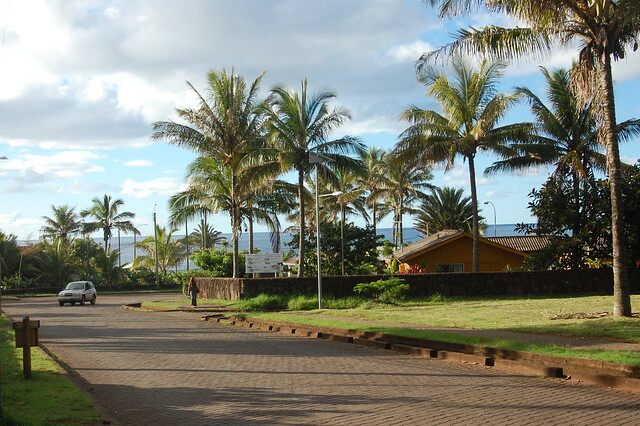 Its driver, a friendly woman who lived in Hanga Roa, offered us a ride, but informed us that she did not really know how to drive the manual transmission car. We had a great chat and lots of laughs as the car stalled along the way, and the ride completely saved us a long walk back! 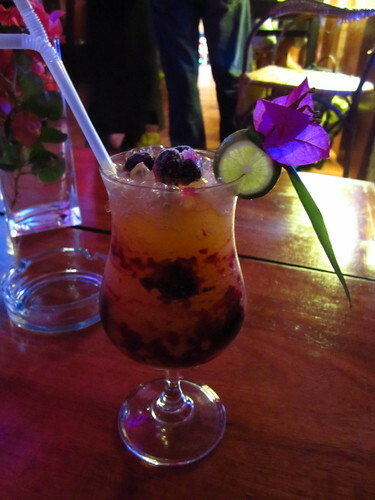 From there, my friend and I decided to get dinner at the same sandwich shop we’d visited a few nights before, and then went to another bar, Dominican, on Rapa Nui, where they were playing live reggae music in Spanish and in Rapa Nui. It was a perfect way to end a long, very interesting day. 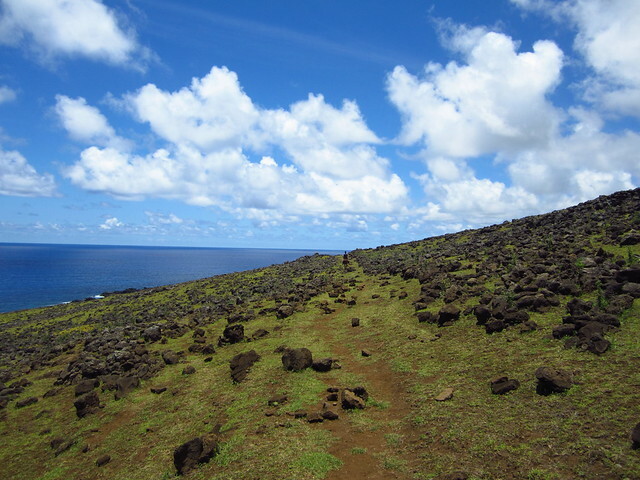 On my third day on Rapa Nui, I was ready to continue exploring the island on foot. At this point, my feet were still in pretty good shape, so I set out towards Vinapu, picking up some empanadas for the road. 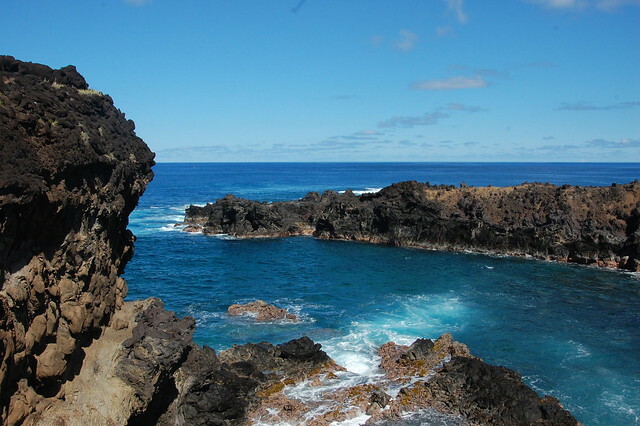 As it turns out, the walk to Vinapu is a lot longer — and dustier — than I expected it to be. 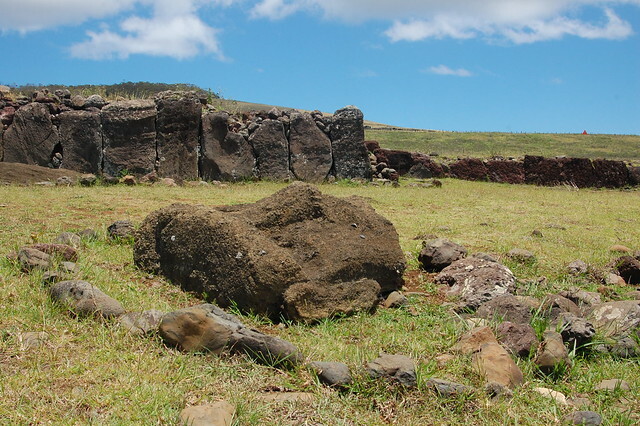 I got about halfway there before a pickup truck pulled up next to me and its driver offered me a ride, a classic example of the Rapa Nui hospitality. 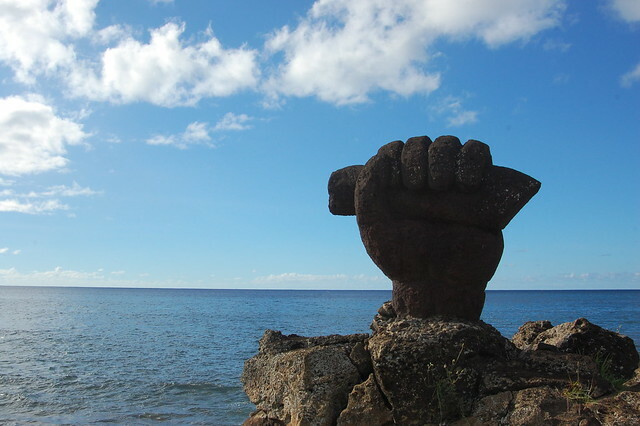 Rapa Nui is so safe that it is more than okay to hitchhike and accept rides. The generous driver worked for the power station which was right by Vinapu, and saved me quite some time in the hot, persistent sun. Arriving at Vinapu, I quickly saw that I was the only one there, though there were people closer to the water’s edge, picnicking or biking. 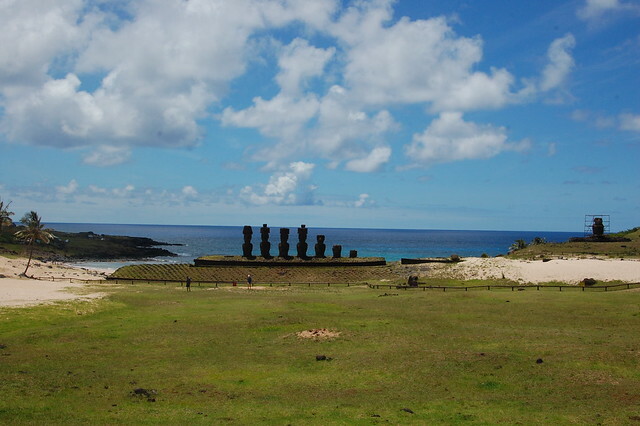 Stunned and appreciative of my surroundings, I approached the first ahu I’d seen with fallen moai. 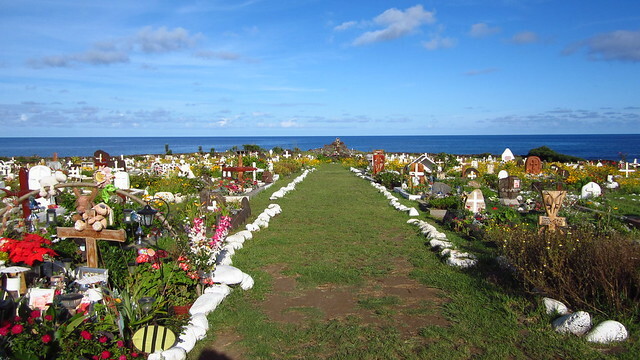 Seeing these gorgeous statues tumbled to the ground with their pukao (topknots) scattered nearby was incredibly moving. 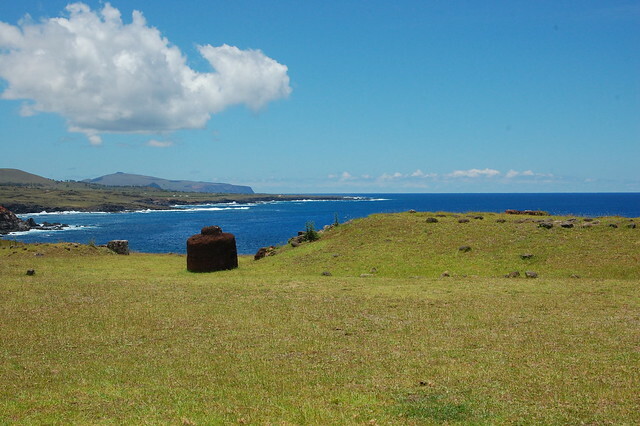 I sat near the ahu with my simple lunch of fruit and an empanada, taking in the scenery. 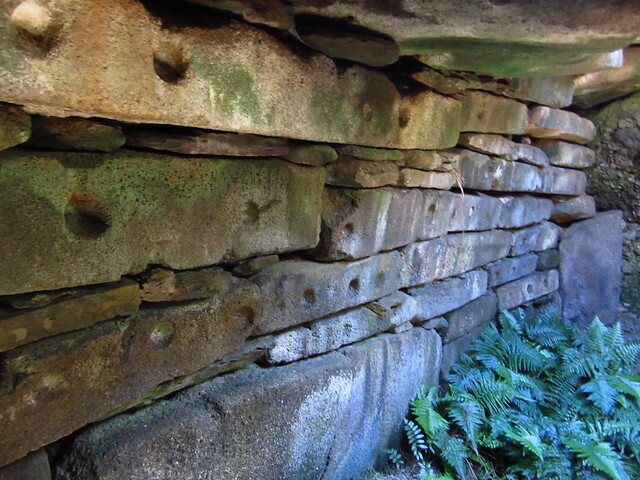 From there, I continued to walk around the site. 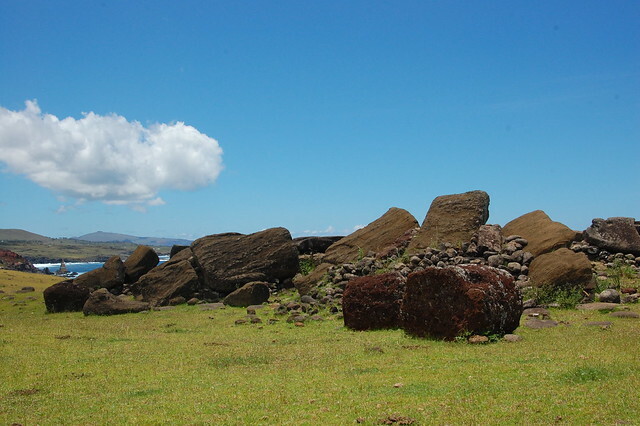 I approached different pukao, took in the gorgeous southern coast with the incredibly blue sea, and came around to the other side, where I saw more fallen moai and the impressive and unique stonework of the ahu. 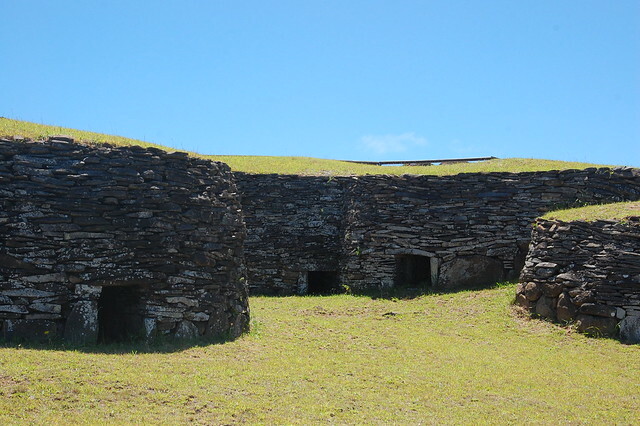 The stonework at Vinapu is supposed to be particularly interesting because of the resemblance it bears to Incan stonework. 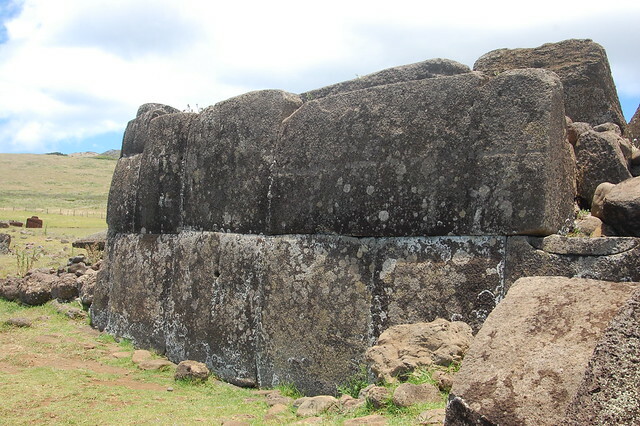 People, like me, who visit from Peru are especially encouraged to check it out for that reason! 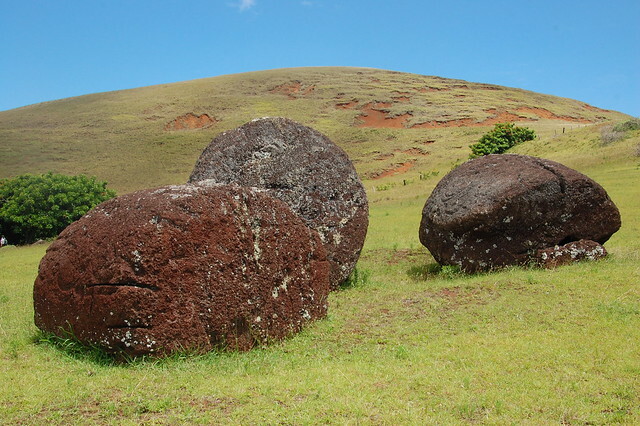 It’s interesting to inspect the moais‘ heads up close, and wonder about how they got there, which ancestor they represented, and why they ended up being toppled over. There are lots of theories, and each seems rather heartbreaking. 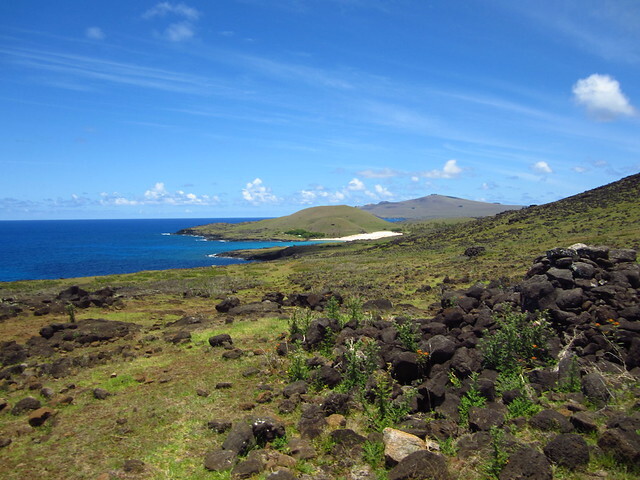 From Vinapu, I headed back down the dirt road towards the main road. Soon after I passed the power station, another man passed by to offer me a ride to the main road, saying that I had a long way to cover on foot. 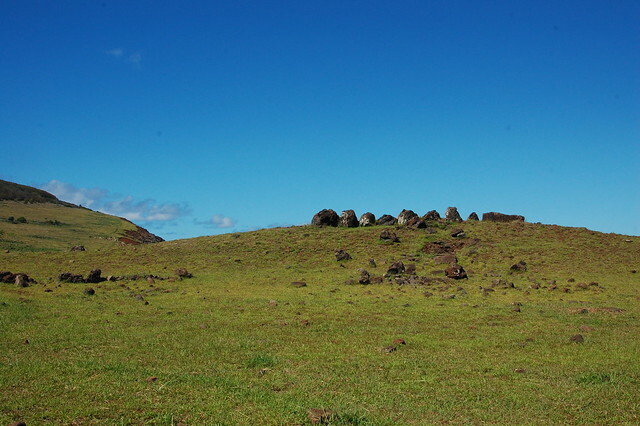 After talking about my plans to walk to the next closest site on the south coast, he suggested that I head to Puna Pao instead, and generously went out of his way to take me to the intersection of the road leading up towards it. 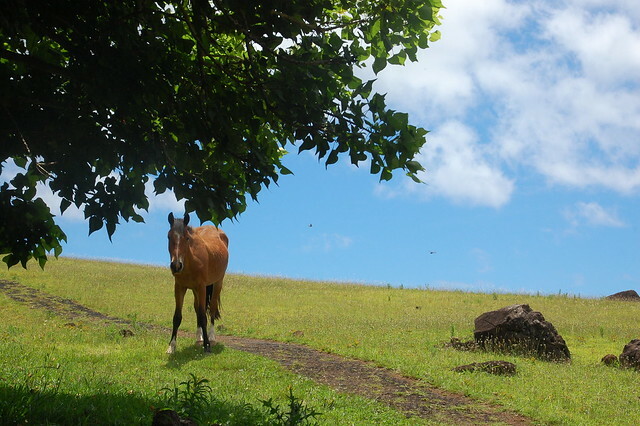 When I arrived to Puna Pao, I found myself alone — well, with the exception of a few horses grazing nearby. I sat under a tree for a little while and ate another snack, appreciating the brief moments out of the sun. Then I headed up the hill to look out over the rocks spotting the landscape. 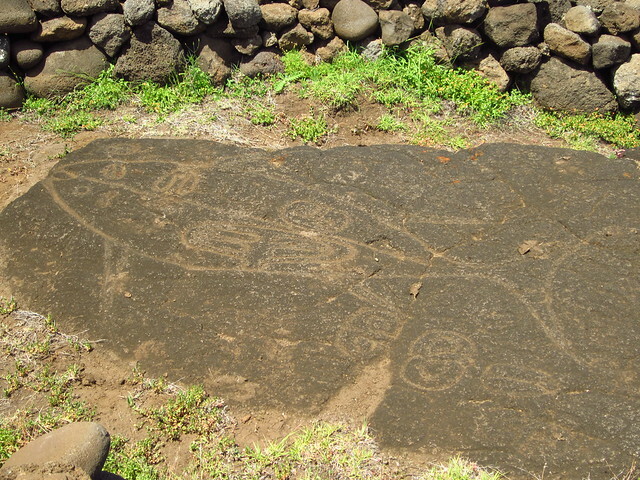 The pukao, or topknots, were carved out of this stone; Puna Pao is known for being the quarry where the pukao were born. 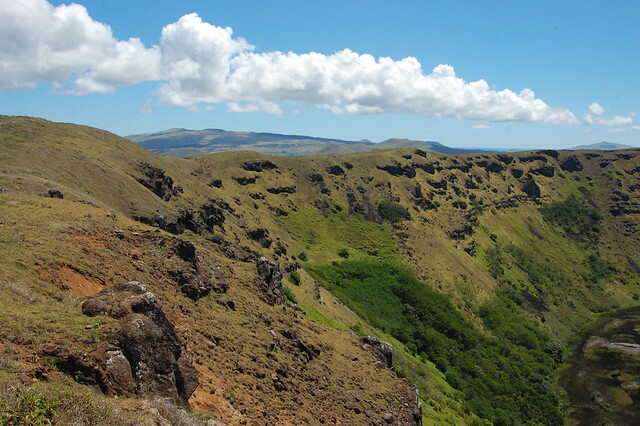 You can see the quarry and scattered, abandoned pukao in the picture on the right. 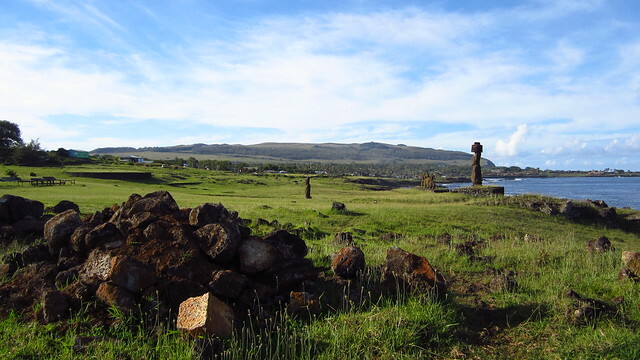 When you reach the top of the hill, there is yet another wonderful panoramic view of Rapa Nui, including Hanga Roa and the nearby hills. 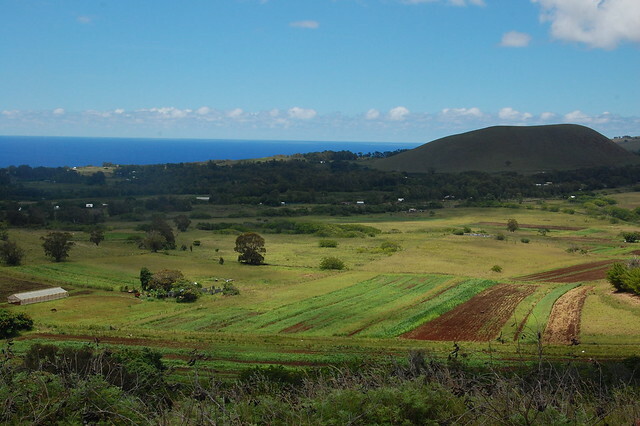 The greenery of the local farmlands is lovely, as are the views of the town as you look out towards the sea. As I headed back down the hill, a few tour buses pulled up, and I knew it was time to head on my way. 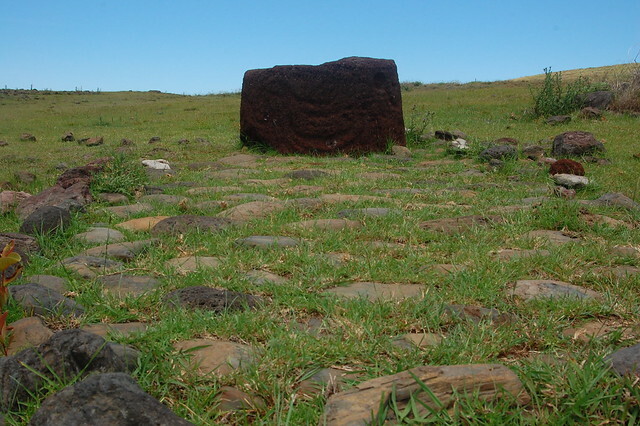 I walked back to the main road, and as I was walking around it, beginning the long journey back to Hanga Roa, I saw a car pass, turn around, and then head back towards me. Two women pulled up alongside me and asked me if I needed a ride; they were Chileans visiting from the mainland, and had spotted me walking and turned around just to pick me up! So kind. We had a nice chat as they drove into town to mail some postcards, and they dropped me off at my hostel. 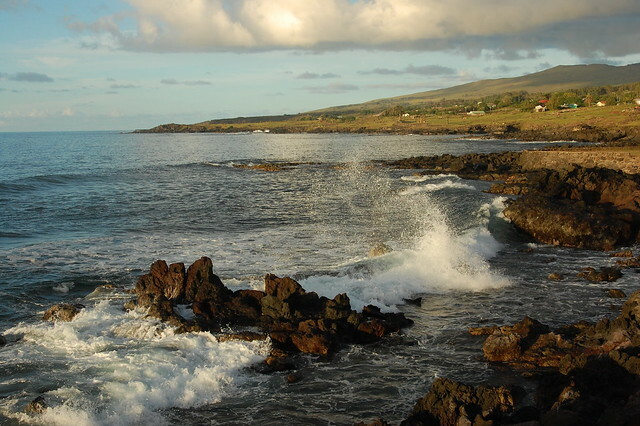 Walking along the north coast outside of Hanga Roa never failed to amaze with the beauty of the water. 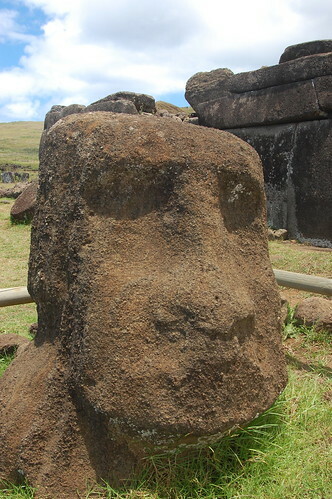 I also appreciate the art inspired by the style of the moai, such as this one! 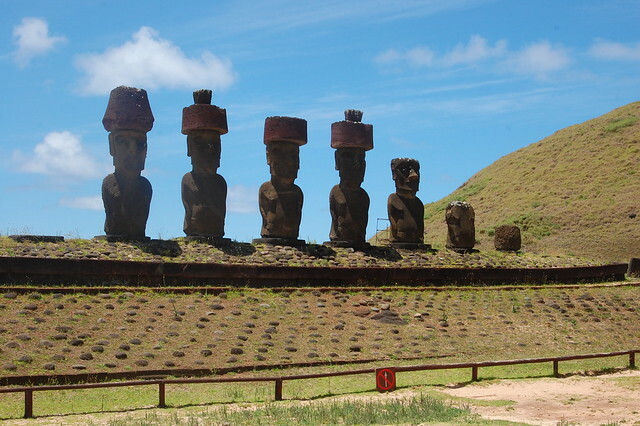 Since it was earlier in the day, Ahu Tahai was nearly abandoned, and I got to appreciate the statues in a less hectic setting. 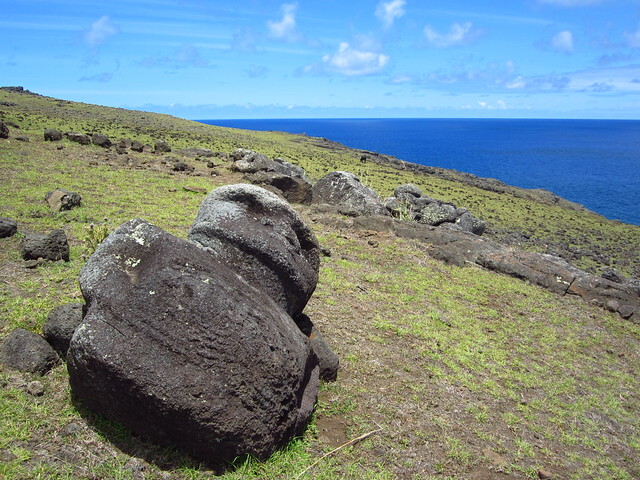 From there, I continued walking up the coast until I reached Hanga Kioe and two more moai, one just a stub after years of decay. 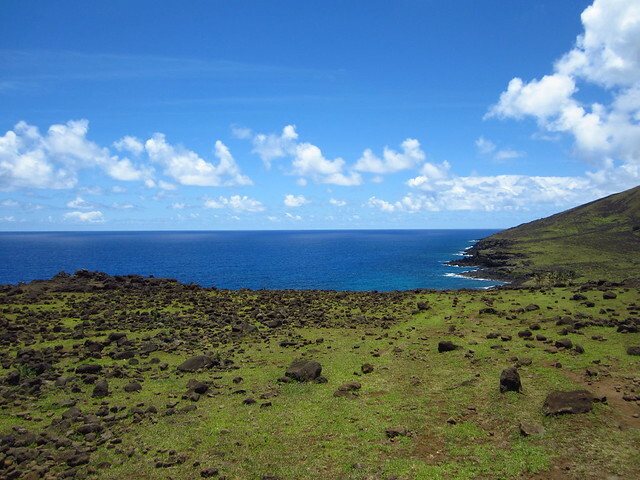 On the way back, the views from Ahu Tahai were astounding. 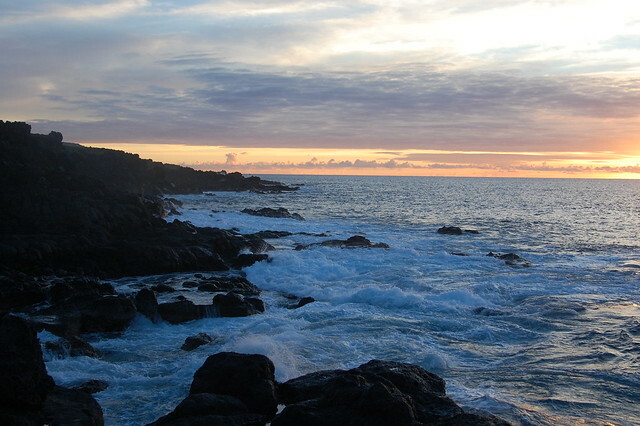 This photo with the late afternoon sun hitting the rocks with atmospheric clouds is one of my favorites from the trip. I headed back into town to meet up with my travel buddy for dinner. 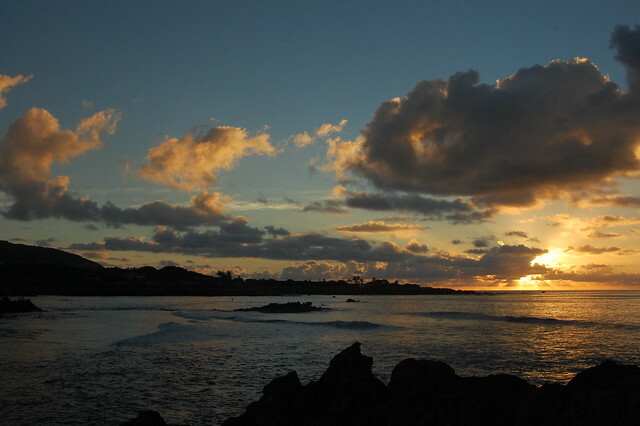 Since the sun sets so late on Rapa Nui, we were able to catch the end of yet another gorgeous sunset from the pier. 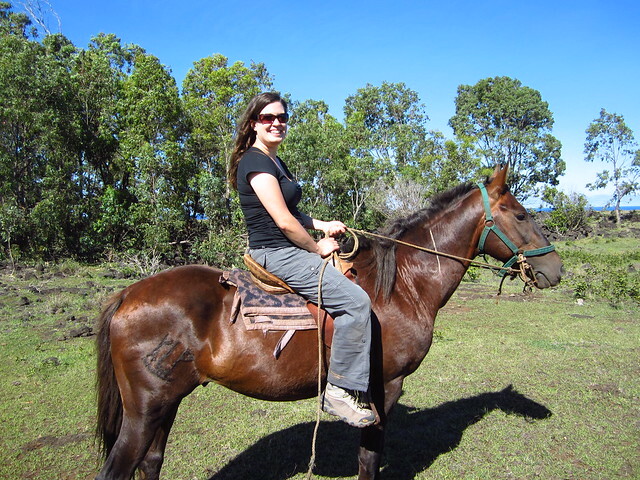 This was a much calmer, quiet night of yet more empanadas and wine, since we had a very early morning planned: covering the north coast on horseback! 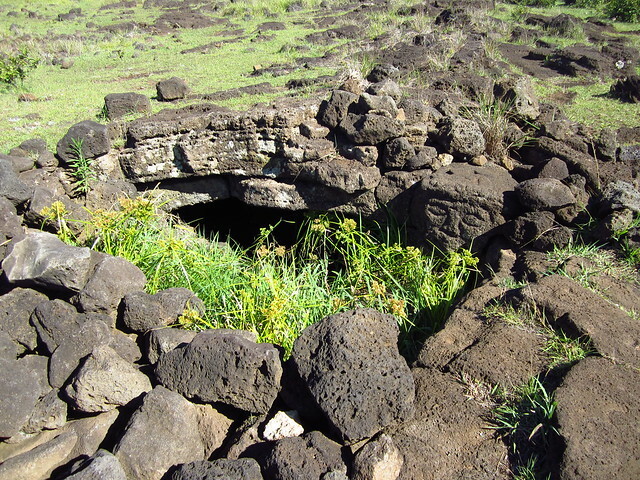 After a good night’s sleep, I got up early on my first full day on Rapa Nui, determined to check out Orongo, the ceremonial center of the bird man cult and one of the major attractions of the island. 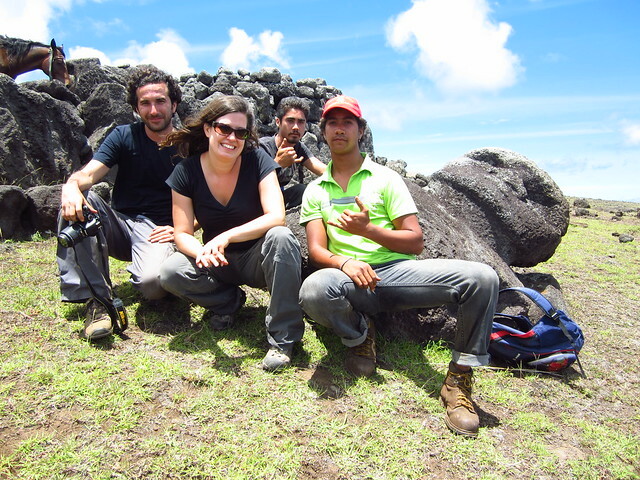 As is my style, I intended to do most of the trip independently, and on foot, incorporating as much hiking as possible into my day. 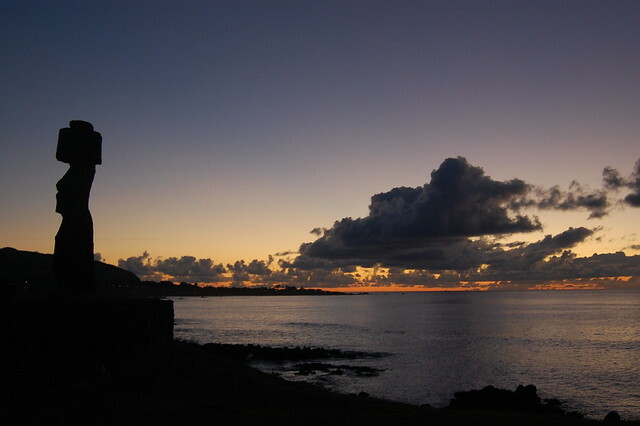 I headed out of town early, though early on Rapa Nui means about 9:30; the sun doesn’t rise until about 7 and doesn’t set until after 9PM! I walked out of town, seeing few others on foot, but eventually catching up to other travelers. 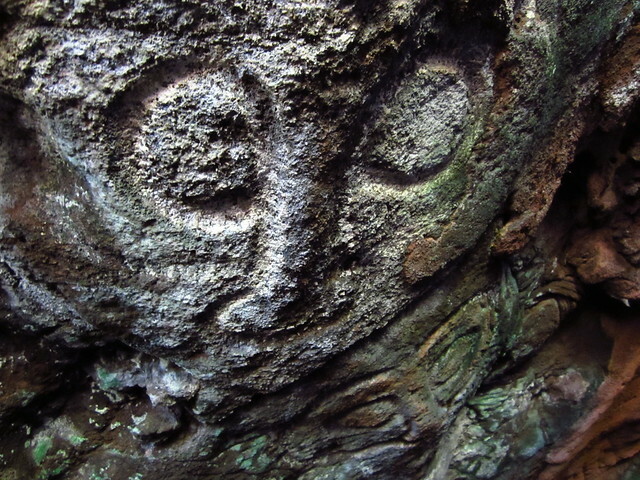 My first stop was into a little cove where you can find rock art in a cave named Ana Kai Tangata. 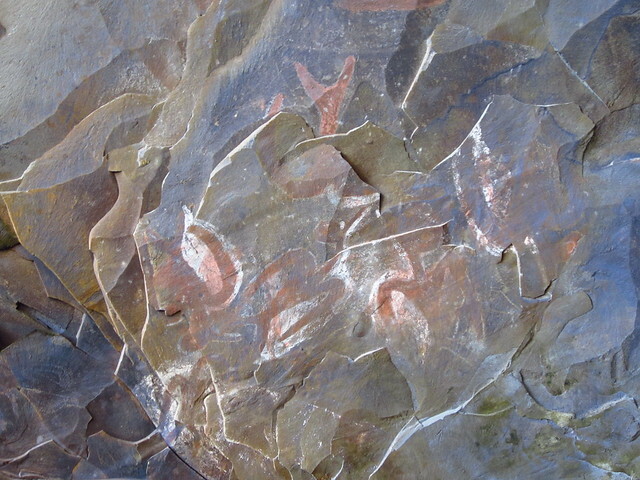 The cave is covered in images representing the bird man. 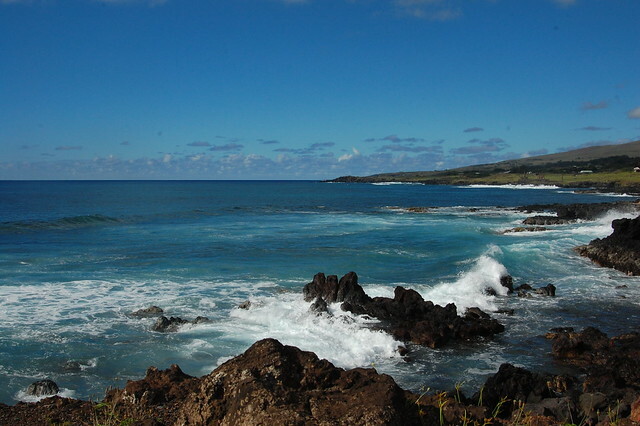 The location itself is spectacular; blue water and skies. 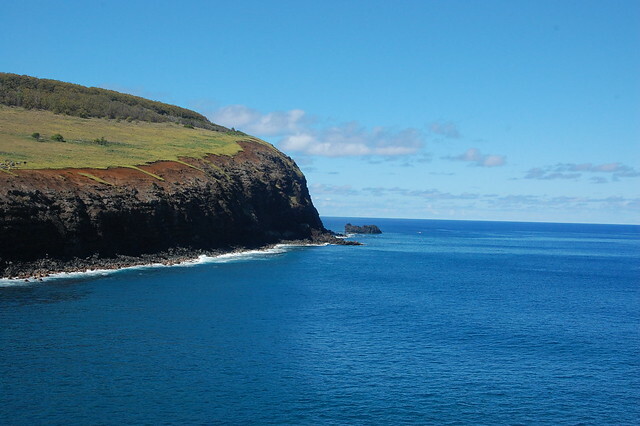 After climbing out of the cove, I walked along the coast to better appreciate the clear blue of the sea, the green hills around me, and the amazing feeling of the strong sunshine on my back. 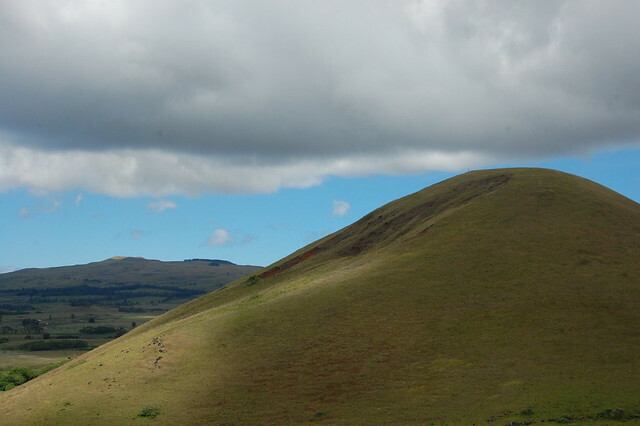 And then I began my ascent up the hill leading towards Orongo. 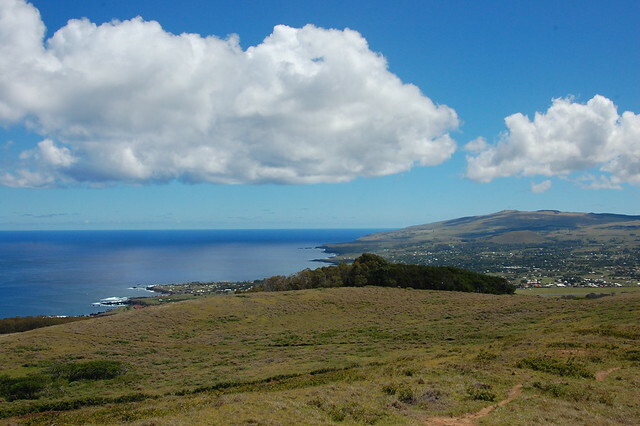 The hike is only an hour or two long, but this is in relentless sun and warm weather, so it feels pretty strenuous. 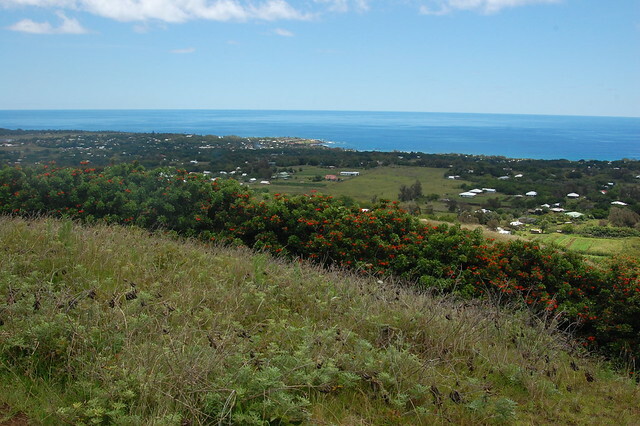 But it’s an enjoyable route, and the views from the top are absolutely amazing. 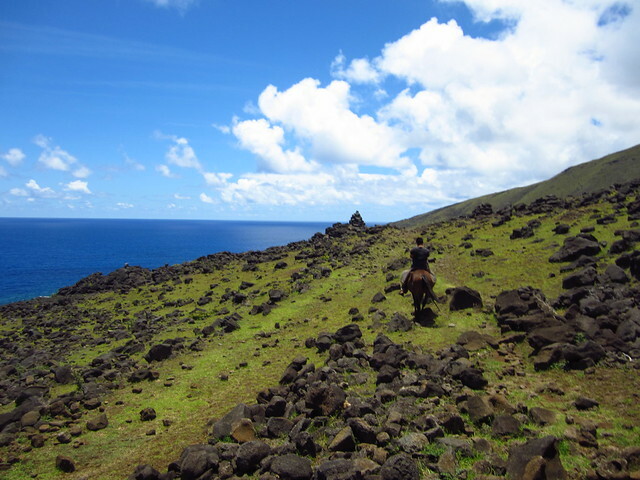 As I approached the edge of Rano Kau, I had no idea what to expect, but what I saw took my breath away. 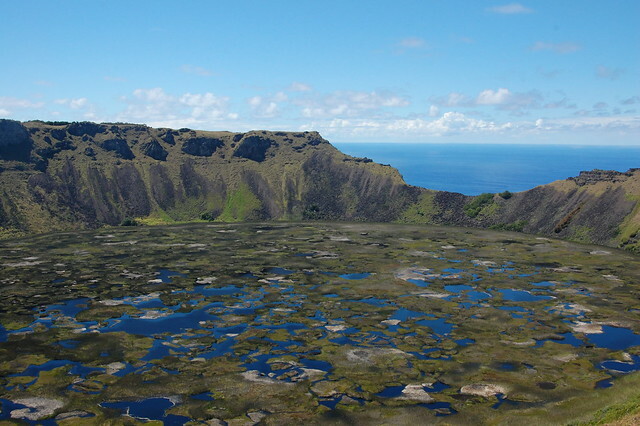 I had never seen anything like this; a deep crater filled with water reflecting the sky and vegetation adding splashes of green, brown, and yellow. 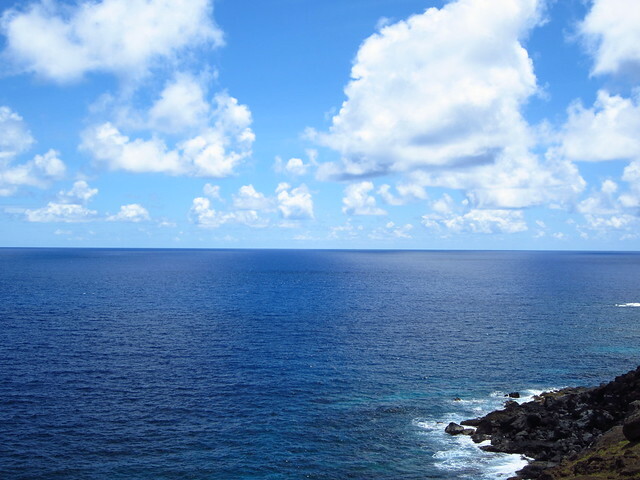 A crumbled wall revealed the incredible blue ocean once again. 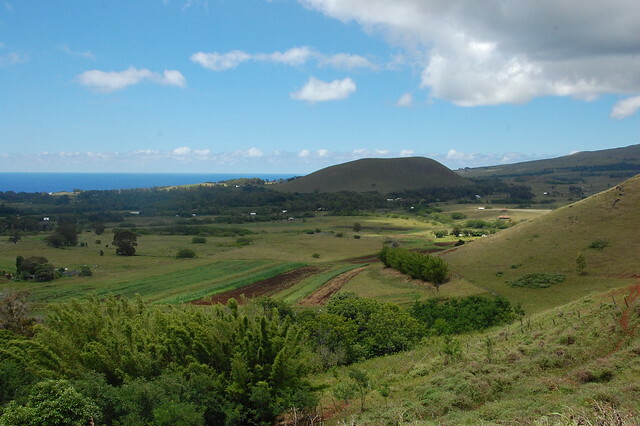 It was astounding, and I could have stood admiring that crater all day. 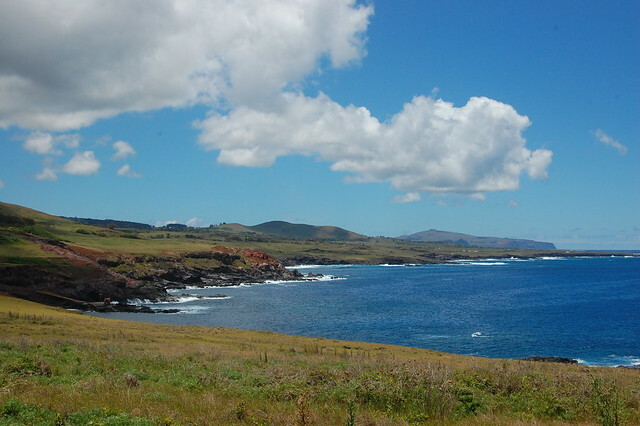 At the same time, the panoramic views back towards Hanga Roa and over the rest of the island were nearly as impressive! 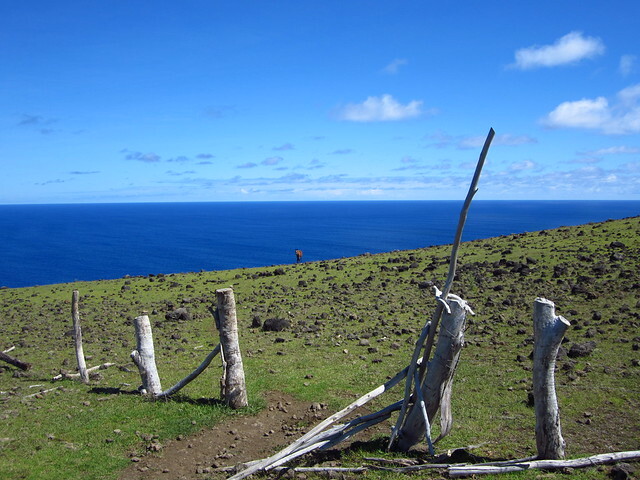 From Rano Kau, I continued the short journey onwards to Orongo. 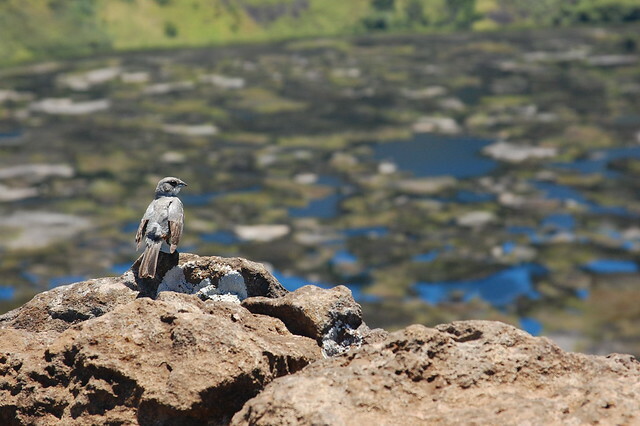 At Orongo I took a minute to cool off and read the displays about the history of Orongo and its birdman cult. 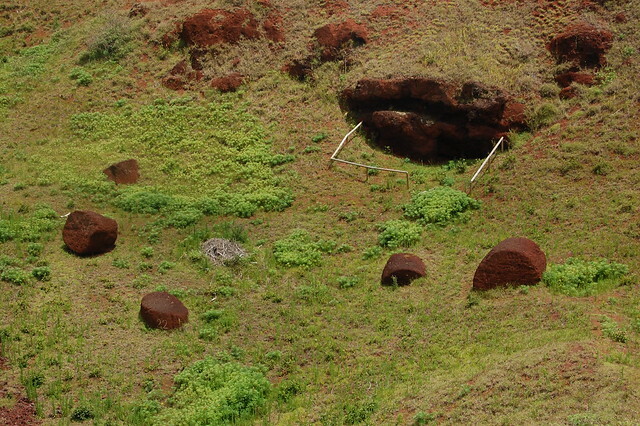 (If you’re interested in learning more, this blog has a good summary as well as nice pictures!) 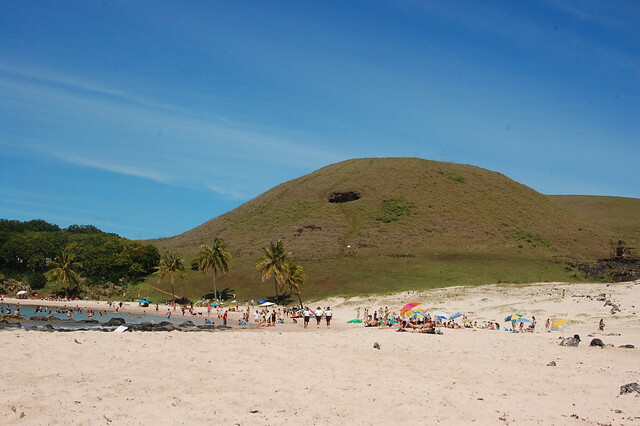 The islands in the pictures below are where competitors swam to collect and bring back the egg of a bird for their chiefs. 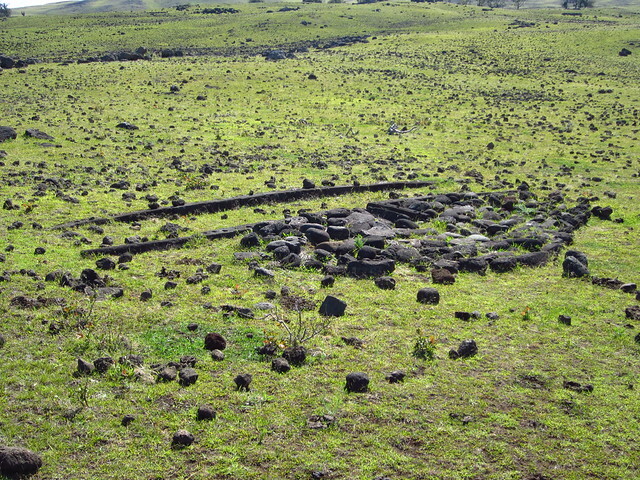 You can also see the ceremonial village and living structures, below. 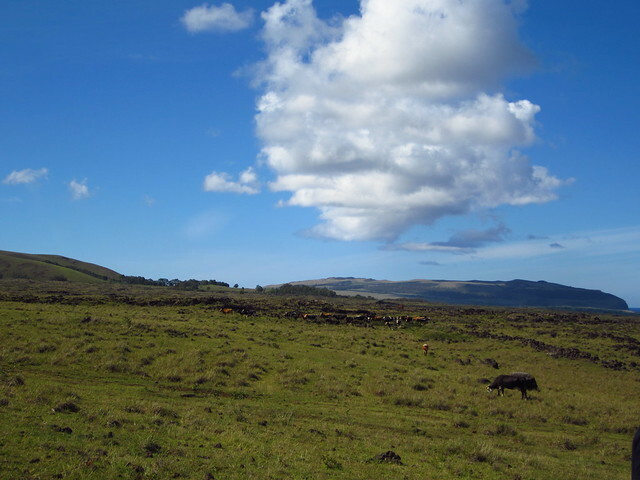 But for me, the most beautiful part of Orongo was the views. 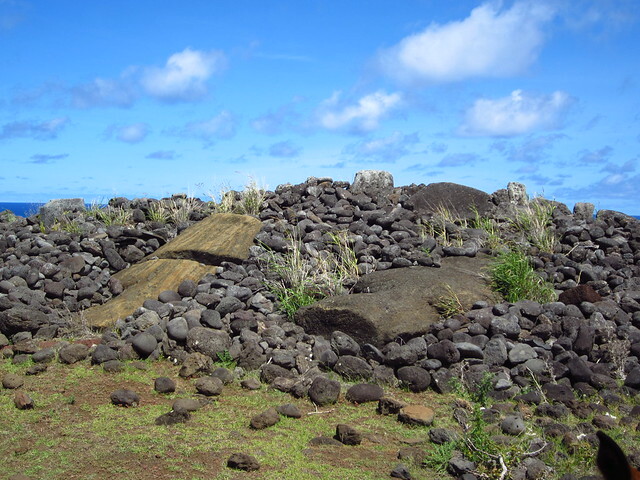 There is some well preserved rock art at Orongo, honoring make make, the god of the birdman cult, but unfortunately it was off-limits to visitors when I was there. This photo got closer than I did! 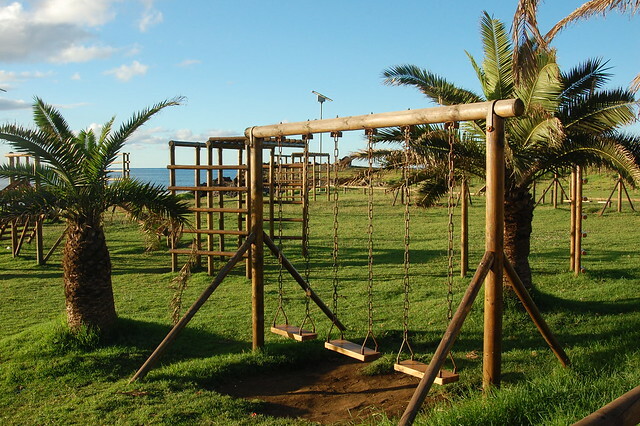 Instead, I appreciated the birds that were around the area; there are only about five species on the island. 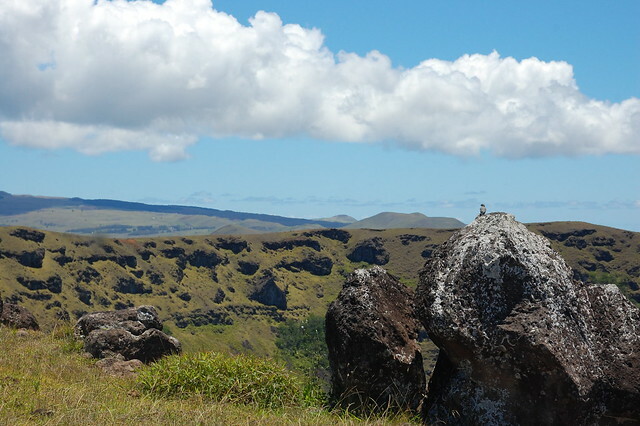 After leaving Orongo, I headed back to Rano Kau to enjoy the views of the crater once again, and then headed down the hill. On the way down, I ran into my new friend, who was on his way up, and we made plans to meet up again that night. 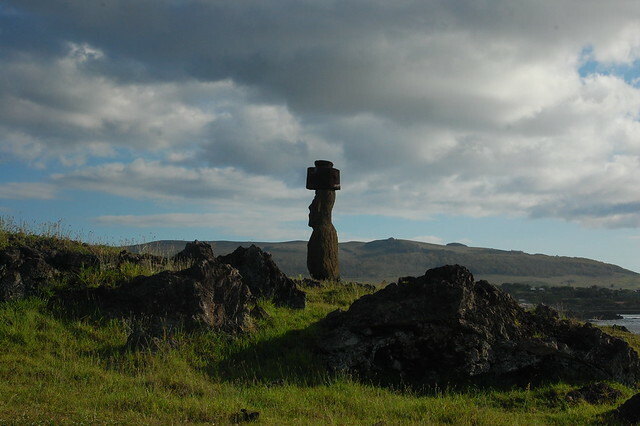 I headed back into Hanga Roa and wandered over to Ahu Riata, where there is a lone moai near a busy road on the outskirts of town. From there, I walked back to my residencial, passing a yoga studio, which I unfortunately did not get the chance to check out on my trip. 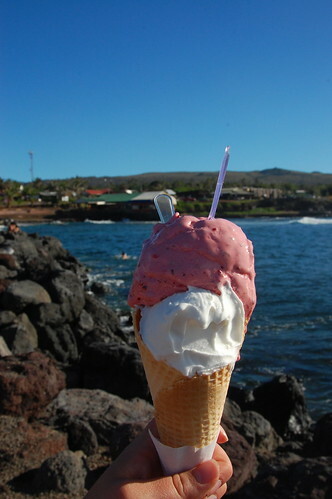 After giving myself a brief rest to recuperate from the day’s walking, I headed back to Mikafe for some more gelato. 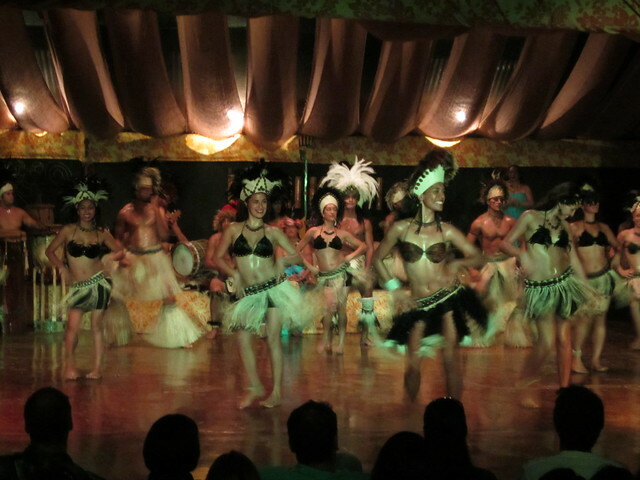 And then it was time to see Kari Kari, the folkloric cultural ballet performed in Rapa Nui by dancers in amazing physical condition. You might think that a performance of traditional dance for tourists could be overdone, but instead it was incredibly beautiful and really made me appreciate the music. The dancers never stopped smiling, the story was told through their movement, and the joy of their performance was palpable. I loved it so much I almost went back another time. From there, we headed off in the night in search of dinner and drinks, finding a restaurant with unusual, but delicious pizza, and a bar with some well-crafted, fruity cocktails. 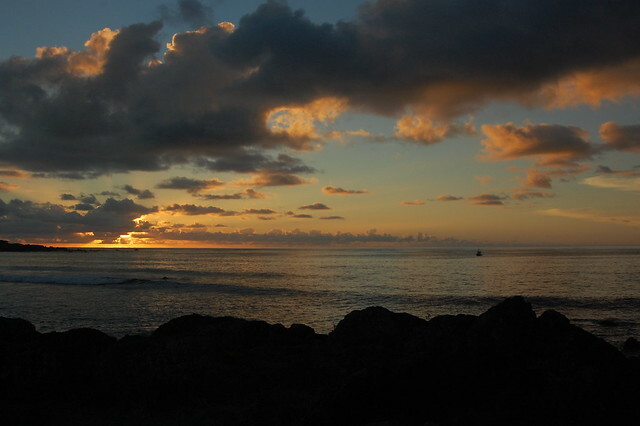 It was the best way to end a truly amazing, joyful day on Rapa Nui. 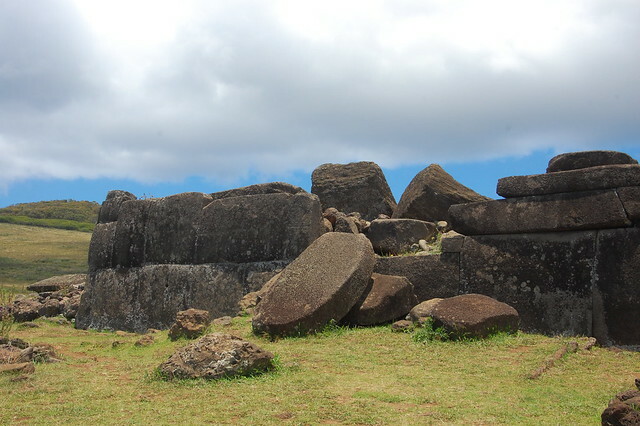 Years ago I decided that I had to visit Easter Island, which is known in Spanish as Isla de Pascua, but is called Rapa Nui by its residents and everyone who visits and grows to love the island. 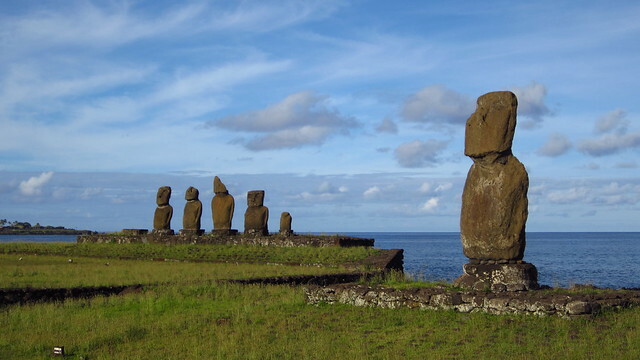 I’m sure I saw some amazing pictures of its moai and was fascinated by the remote Pacific location and mysterious history, and visiting the island ended up on my life list, that ever-changing and expanding list of dream travel destinations and personal goals. 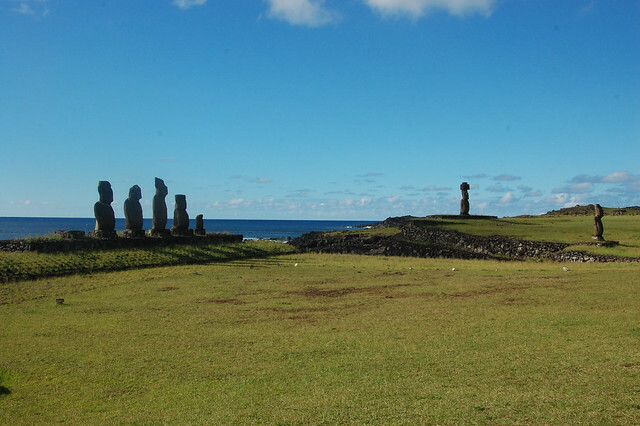 After I’d made the big decision to leave life in the U.S. behind to volunteer in Peru, I happened to see a flight deal from Lima to Rapa Nui, a deal that made this dream affordable. 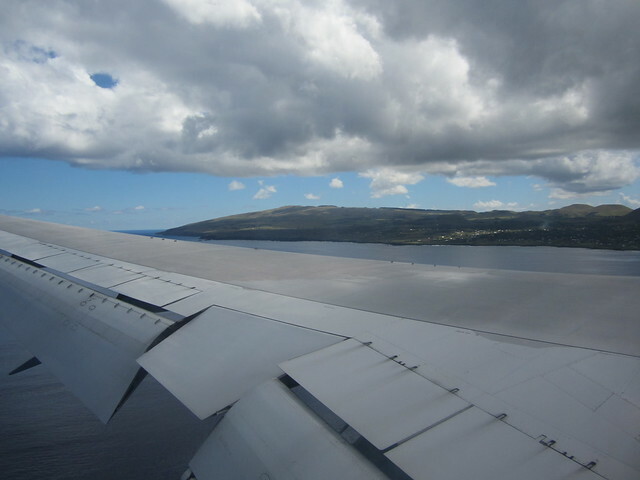 I had a nice chunk of time between the end of the our programs for 2012 and my flight back to the U.S. for Christmas, and the flight deal would give me just over a week on the island. 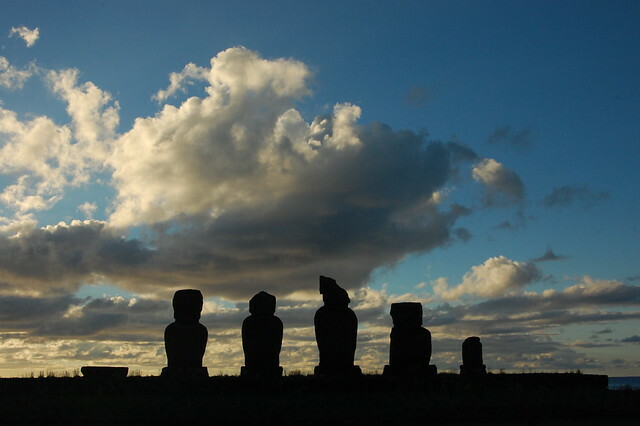 You’d think that I would have booked my ticket immediately, but I debated the decision for a few months, as there are so many other places I want to see in Peru and its neighboring countries. I suspect it also just seemed far too easy to fulfill my dream. I finally pulled the trigger in September and booked my trip. I know now that it was meant to be; the serendipity throughout my entire trip is undeniable. 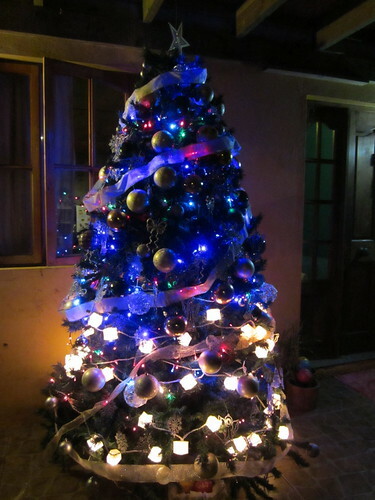 By the time December hit, I’d been living in Huaycán for over five months. The end of the year was hectic and I was focused on finishing it as strongly as possible and setting myself up for a better 2013. I also had to pack the majority of my belongings in my backpack once again and store the stuff I didn’t need for my return in January. 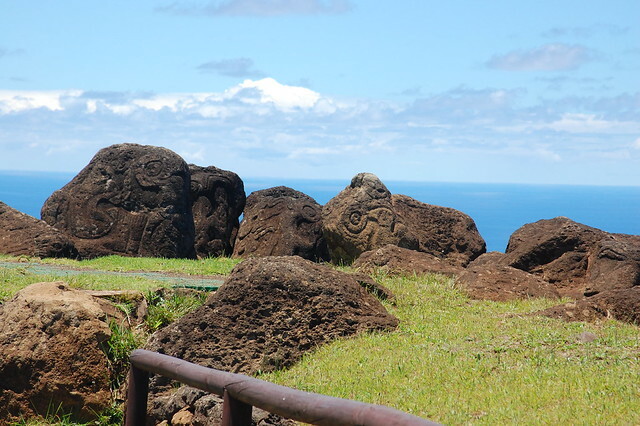 I read a little about Rapa Nui and marked some places as “must-sees,” but as my departure date approached, I was anything but over-prepared for the trip. That’s how I travel; I prepare myself with a little background knowledge, but leave the rest open so my destination can surprise me with its story and my itinerary can fill day by day as I learn more. It works for me. My flight on December 12 was scheduled for 1:20AM; it was supposed to be an overnight flight, which gave me the whole previous day to transition from hard-working Kim to travel Kim. Late in the afternoon the day before my departure, I received a message that the flight had been delayed, and was now leaving at 6:45AM, which meant I’d be arriving to the Lima airport in the middle of the night. 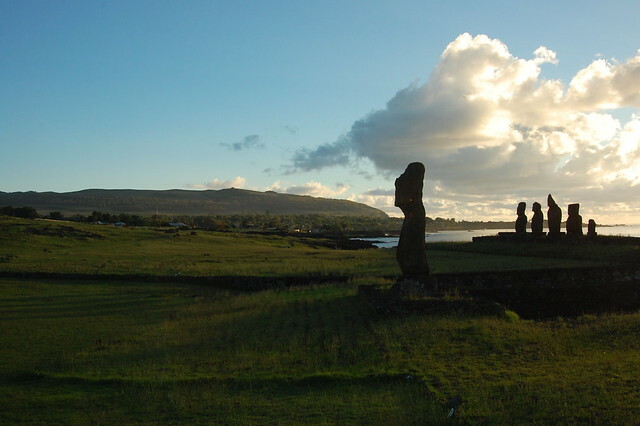 Delays are very common on flights to and from Rapa Nui; the island is very small, the runway, the whole length of the island, and weather issues anywhere on the flight route can affect travel plans. As it turns out, when I finally boarded my plane in Lima, there was another plane on the island and we had to wait until it left before we could even take off! Waiting in the boarding area was fascinating. There were a lot of people traveling by themselves, like me. Some people were very obviously backpackers on a round-the-world trip; others were couples or families. Many people had spent the night in the airport since they hadn’t received advance notice of the delay. 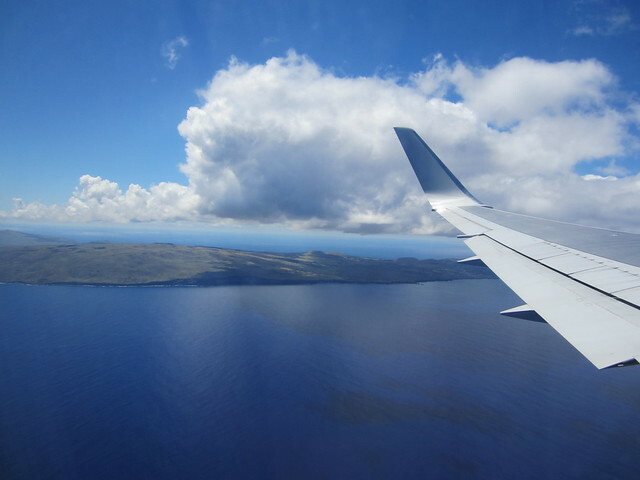 When it was time to board, we patiently and quietly waited in line, and many people pulled out their smartphones to snap pictures of the departure gate screen, with IPC (Isla de Pascua, Chile) as the destination. I wish I’d done it too! 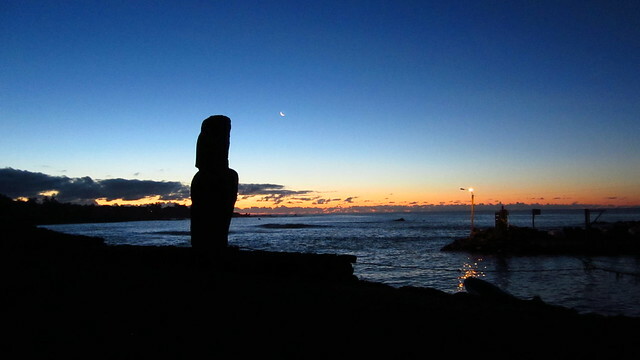 It made me smile because I knew other people felt as I did; this is a once-in-a-lifetime trip. 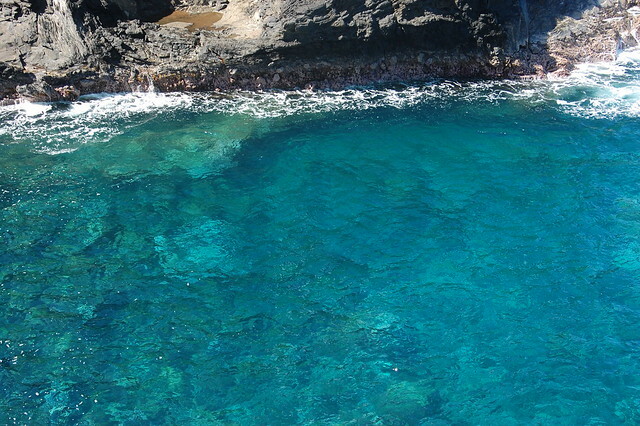 Blue water everywhere. 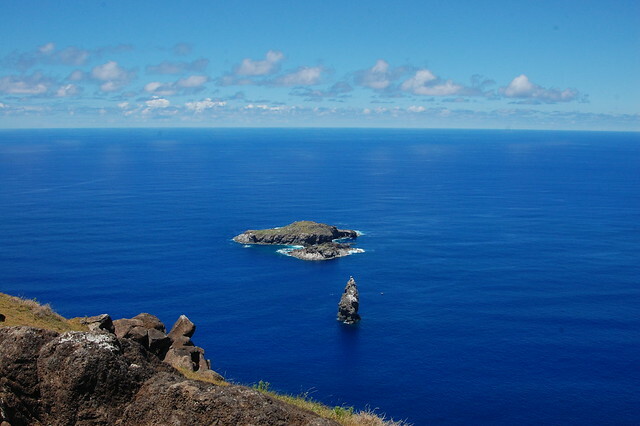 Yes, we were really in the middle of the Pacific Ocean, in one of the most isolated locations on Earth. And my adventure was about to begin.